I originally posted this recipe at the beginning of October. It would be a delicious dessert for the new year. I was visiting my family recently and my mom bought 16 pints of fresh fall raspberries to make chocolate raspberry jam. Wow! I was happy just eating these raspberries fresh, but wanted to challenge myself to develop a lemon raspberry FODMAP friendly recipe. After playing around with a few things, I came up with a macaroon crust filled with a healthier version of lemon curd, topped with a delicious raspberry. This macaroon crust is quite simple – unsweetened coconut, egg whites, and sugar. Mix the three together and press the mixture into mini muffin tin molds. Bake for about 15 minutes on 300 degrees F until the shells are lightly golden brown. The next step is to make the lemon curd. This part is a little more intensive. Whisk together eggs, sugar, lemon juice, and salt, then heat over a double broiler or a make-shift double broiler (instructions below). Whisk until the mixture thickens, stir in the butter, and let cool. After the lemon curd cools in the fridge for a few hours, mix one cup of the lemon curd with a one cup of 0% Greek yogurt. Adding the yogurt keeps the mixture creamy, but makes the dessert a bit healthier. Fill the macaroon shells with the lemon curd mixture. You’ll have quite a bit of extra lemon curd mixture. Try eating it for breakfast with granola or on top of pancakes. Top each mini tart with a fresh raspberry. 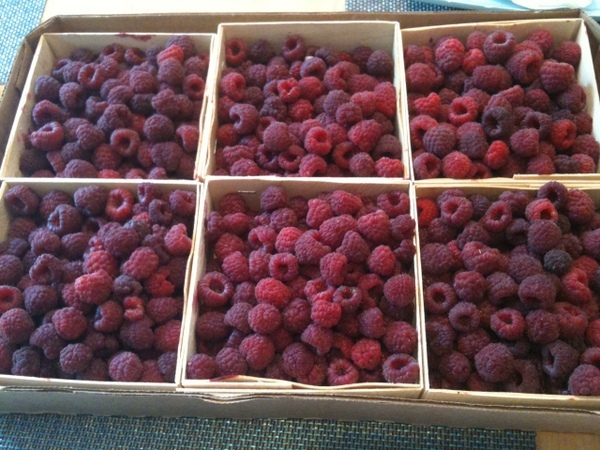 You can also make larger tarts and top with multiple raspberries. 2. In a medium bowl, mix together the sugar, egg whites, and coconut until combined. 3. 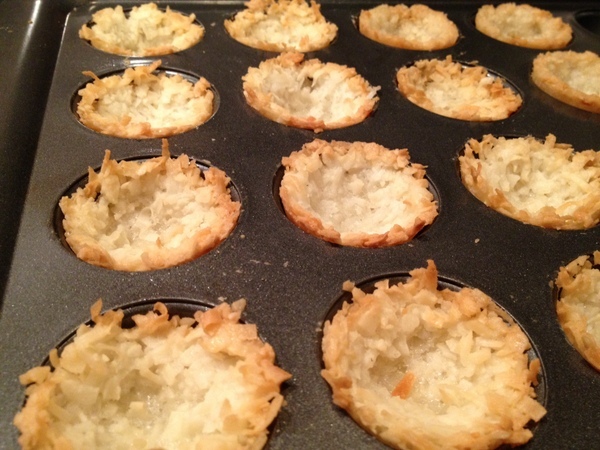 Grease a mini muffin tin and press the coconut mixture in with your fingers to form the mini crusts. You will need about a tablespoon for each one. 4. Bake for 10-15 minutes until the crusts are lightly golden. 5. This recipe will make about 25 mini crusts. 1. Whisk together the eggs, egg yolks, sugar, lemon zest, lemon juice, and salt in a a double boiler. If you don’t have a double boiler, find a small pot or bowl that will fit into a larger pot with simmering water. Make sure the bowl on top does not touch the water. 2. Whisk the lemon mixture constantly until the mixture starts to thicken, about 5 to 6 minutes. Don’t let the mixture boil. Remove from heat. 3. Stir the butter into the mixture until it melts. 4. Refrigerate the lemon curd for a few hours. 5. 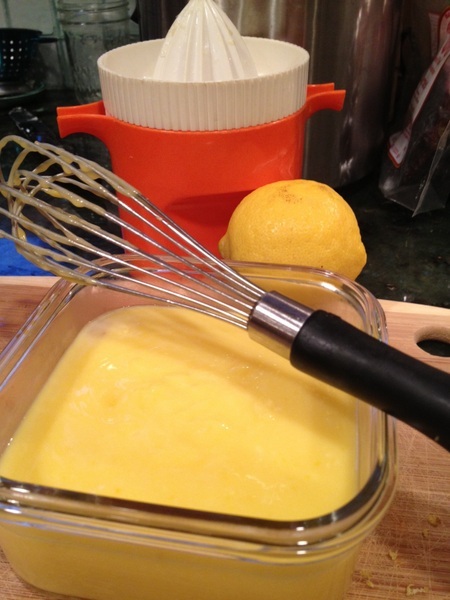 When the lemon curd is cool, mix one cup of Greek yogurt with one cup of the lemon curd. 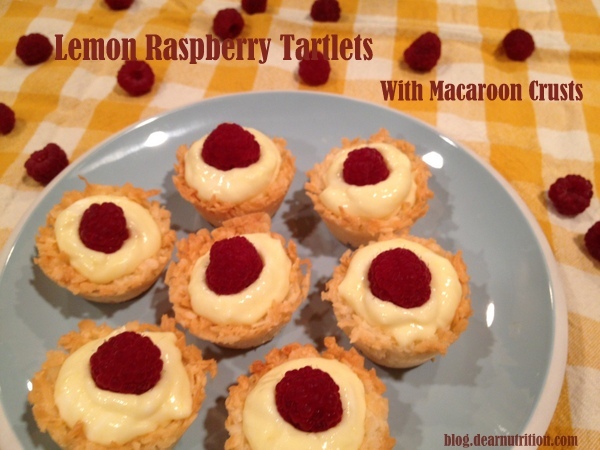 Fill each macaroon crust with Lightened Lemon Curd and top with a fresh raspberry.